Internationally known as “The River Of Gold”, Sungei Wang exudes charm and popularity both among tourists and the locals. It’s one of the longest running malls and best shopping mall in Kuala Lumpur, Malaysia. 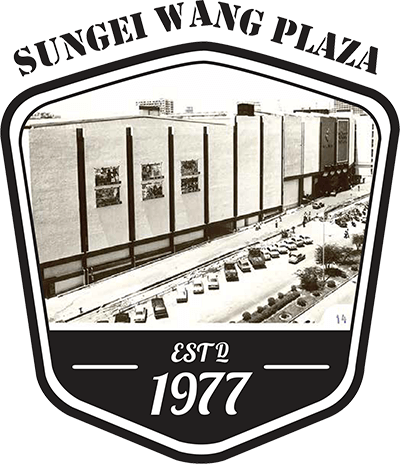 Sungei Wang opened for business in 1977 with 1.2 million square feet mall consists of seven shopping levels and three split-level basement parking spaces. The mall continually receives an average of two (2) million visitors on monthly basis. In year 1992, USD 10 million was invested and refurbishment of the retail floors. In late 2012, the mall went through its second massive refurbishment. The RM30million project saw massive changes to brighter painted ceilings and floor tiles, a freshly repainted façade, upgraded lift lobbies, improved all signage as well as centre court. In addition, a RM2.3million covered walkway is built along the mall’s frontage on Jalan Sultan Ismail which replaces old Fiesta Street to ‘Sungei Wang Walk’ as well as 132meter covered walkway links Jalan Imbi to Sungei Wang and Bukit Bintang’s Monorail Station. Known as one of the happening malls in town for its events and promotions since 90’s until today, Sungei Wang is the home for numerous popular international and local artistes, fashion shows, countdown concerts, festive season stage showcases and also not forgetting corporate social responsibility programs. There just isn’t a quiet day at Sungei Wang. Having won the ‘Best Shopping Complex’ award several times including Kuala Lumpur Mayor’s Tourism Awards 2011 Award for Excellence in Shopping Mall Category and the prestigious FIABCI Prix d’Excellence under the Special Award (Retail Properties Category) in 1996. It certainly lives up to the title with its effervescent atmosphere, great bargains and year-long activities. Its maze of low to midrange stores sells everything from very affordable clothes and accessories to footwear, electronic items, home décor and various paraphernalia. This is an ideal place for teens and those shopping on a budget. Sungei Wang offers visitors more than 800 retail outlets in one shopping haven complete with ample parking spaces and functional facilities. It stands right outside Bukit Bintang KL Monorail train station and Bukit Bintang MRT station and is walking distance to several malls in the area. Culture Street @ Sungei Wang – Sungei Wang collaborates with Karyaneka, a subsidiary of Malaysian Handicraft Corporation, Ministry of Tourism and Culture Malaysia. Karyaneka will be the Culture Street operator to feature Malaysian finest local craftsmen and artisan. A place where you will get all variety of authentic Malaysian products, souvenirs and gifts. Sungei Wang positions itself as a vibrant shopping hub in the heart of Kuala Lumpur with repertoire of choices in fashion, accessories, mobile phones, gadgets, beauty and many more at affordable rates for all kinds of shoppers. The past 40 years recorded a colourful history of success and distinguished awards for Sungei Wang. Even though swarm by many challenging competitors, the road ahead is undeniably bright and undefeated.